As you might imagine, finding vegetarian foods was sometimes a challenge, though the groups always had other vegetarian members as , as well as very supportive leaders, guides and translators. One of the items they ended up eating a LOT of - and just LOVING - were plantains. Since their first trip, they have begged me to figure out how to make the beloved "smashed plantains" that became a staple of their diet. After many interesting attempts and much reading up on the subject, I think I figured it out! The native people simply called them "Plátanos verdes fritos" when my Sprouts asked, (which basically means "fried green plantains" if my poor grasp of Spanish is correct? ) but in looking for recipes and instructions I've since found they're Latin American favorite known as patacones in South America and Mexico and tostones in Cuba, Dominican Republic and other places... regardless of what you call them, they are a specific kind of "fried plantain" - green, twice-fried and flattened. A good amount of coconut or peanut oil (I won't say how much 'cause it'll sound freakishly fattening!) for frying. Yes. We're going to FRY these! Cut plantains crosswise into 1-inch-thick pieces and then slit down the side of each piece. Pry skin from pieces. It is messy! This is a good reason to have kids because they like doing this! 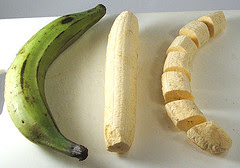 Or... if you can somehow peel the whole plantain and then slice, that works too. In a 12-inch nonstick skillet heat 1/2-inch oil over moderate heat until just hot enough to sizzle when a plantain piece is added. Fry plantains in batches, without crowding, until tender and just golden, 2 to 3 minutes on each side. With tongs or slotted spoon, transfer plantains to paper towels to drain. Remove skillet from heat and reserve oil. With the bottom of a heavy can or a wide solid metal spatula and flatten plantains to 1/4-inch thick (about 3 inches in diameter). 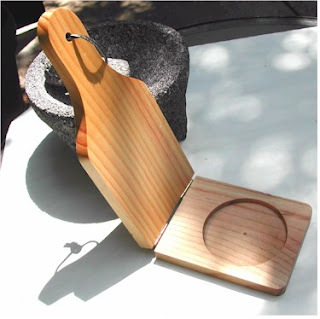 Or use a special flattener called a tostonera - a nifty little tool my oldest specifically brought back with her from her last trip, JUST SO I would make these again. How could I refuse? 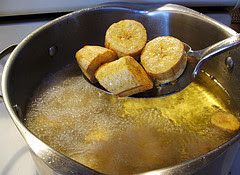 Into a bowl of warm salted water dip flattened plantains, 1 at a time, and drain them well on paper towels. Heat reserved oil over moderate heat until hot but not smoking and fry flattened plantains in batches, without crowding, until golden, about 3 minutes. 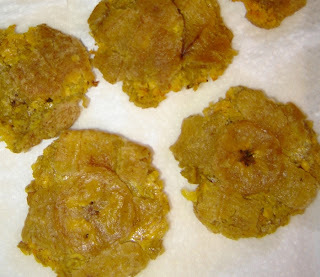 With tongs transfer tostones as fried to paper towels to drain and season with salt if desired. I know, this is the recipe you've all secretly been wanting, right? Yeah, thought so. One final note. If you should ever send your teen on a trip to the wild jungles of Ecuador, and she proudly shows you a picture of her perched on top a moving vehicle.... do not ask how FAST that vehicle might have been going down those jungle roads... Yeah. That the way we do it here!!!!! yum i love tostones. i love plantains. i've had my fair share of tostones and fried sweet plantains. Those look like quite a treat! How ownderful that your girls are traveling and experiencing other cultures at such a young age. Yep! you got it right. Perfect!